← Blu-Ray News #201: The Mole People (1956). Blu-Ray News #202: The Return Of The Vampire (1944). 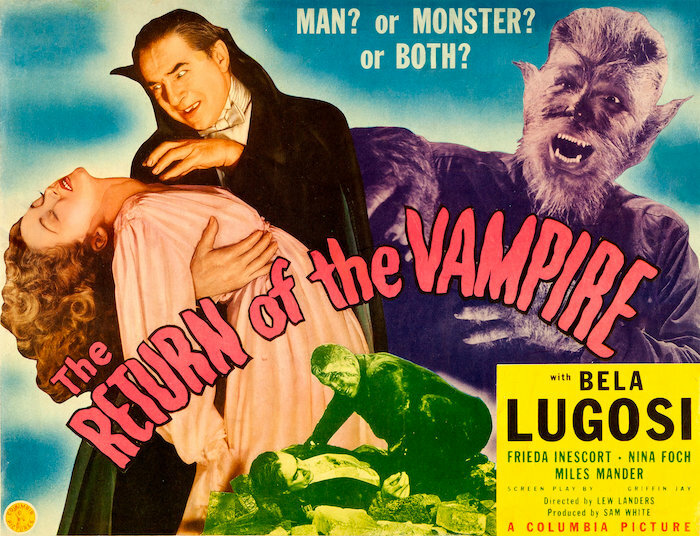 The Return Of The Vampire (1944) was Bela Lugosi’s last starring role for a major studio (Columbia). It’s the closest he came to making a sequel to his 1931 Dracula, though you could make a strong case for Abbott & Costello Meet Frankenstein (1948). Lugosi’s Armand Tesla (pretty much Dracula with his name changed for copyright reasons), a vampire in London who’s awakened by a Nazi bomb (what a great plot point!). Accompanied by a werewolf sidekick, Tesla/Dracula is soon seeking revenge on those who staked him back in 1918. Scream Factory has announced its February Blu-Ray release. Extras and stuff have not been disclosed as of yet. was Bela’s last starring role in a major studio movie. page-which really,from a cursory look means Horror and Sci Fi on Blu Ray. releases (b) go International (c) money is no object. is superior to the Warner Bros release. I might add that I have the Warner version which I thought looked stellar. which again I thought looked wonderful. Those were the days when I could afford Twilight Time releases. seems to include anything with Hammer’s top guns Cushing and Lee. to know what the “bonus” film is included in the package. they have not done with them yet. like THE VIKING QUEEN will eventually turn up on Blu Ray. Mill Creek has a Robin Hood collection of 5 films coming on DVD (not Blu). It includes SWORD OF SHERWOOD FOREST and the three others that have been out in the past separately from Sony. The fifth title in the package is not a Robin Hood movie–it’s THE BLACK ARROW, which was out previously as a Sony Archive MOD release. Texican, I think we should give a Shout Out! to SHOUT! FACTORY and MILL CREEK ENTERTAINMENT for releasing affordable DVD’S. SHOUT! FACTORY is placing extra features on some of their recent collections. As in the BILLY JACK and WALKING TALL collections. I watched “Return of the Vampire” not too terribly long ago. It’s a better little film than I remembered. I’d picked up the Sony dvd about a decade ago at a Big Lots store for only about three dollars. Can’t deny I’d like to upgrade to blu, but I’ll demure in this case, as it’s all a matter of pocketbook priorities. I have a hard time justifying upgrades from highly decent dvd’s to blu, unless it’s a major, major favorite. There are just so many slews of films I love which I only have copies of in either decades-old VHS off-air recordings, or muddy-looking bootleg dupes of scratchy old 16mm tv-prints. It’s these type of titles that I really crave to have upgraded on blu. I will spring for “The Mole People,” though, as I have a particularly strong nostalgic affection for it. Would also love to see “Curse of the Undead” (1959) make the Blu-ray grade, as it’s been absent far too long. Plus, as ridiculous as it is, I have an inordinate fondness for “The Thing That Couldn’t Die” (1958), and would also hope to see it make it to blu. The Universal Vault ‘mod’ of it looks awfully soft, as I recall. But while on the topic of late-50s Universals, something I’d really love to see again is “Damn Citizen” (1957). Saw it on a late-show back around 1978-79, and haven’t seen it since. Bert, I hadn’t thought about DAMN CITIZEN in years. I don’t think I’ve seen it since the early 1970’s. I saw a lot of Universal-International movies on Channel 3 WREC-TV , Memphis, Tennessee back in the day. I remember liking it, because it was loosely based on a true story of Louisiana’s reform Governor Robert F. Kennon’s crack down on corruption in 1952. He appoints Lt. Colonel Francis C. Grevemberg(Keith Andes) to the position of superintendent of state police. Andes, portraying Grevemberg, wiped out corruption in the Louisiana State Police and then went after the rackets. Looking at the movie credits at IMDb, the screenplay was by the Academy Award and Golden Globe winning writer of IN THE HEAT OF THE NIGHT(1967) Stirling Silliphant. This has nothing to do with DAMN CITIZEN, but I remember that during the 1990’s, actor Keith Andes was interviewed on the phone by Ray Nielsen, host of THE GOOD TIMES PICTURE SHOW. Andes had co-starred with Marilyn Monroe in CLASH OF NIGHT(1952). There was always a murmur about them having a relationship. Nielsen actually asked Andes if they had an affair. Andes replied that they didn’t. Yep, Keith Andes guested at one of the Memphis Film Festivals back in the mid-1990s, but it was a year I missed out on going. I think Ben Johnson and Gene Evans also showed up at that one. Plus, Richard Martin (from the Tim Holt films) and his wife. Hate that I missed it. 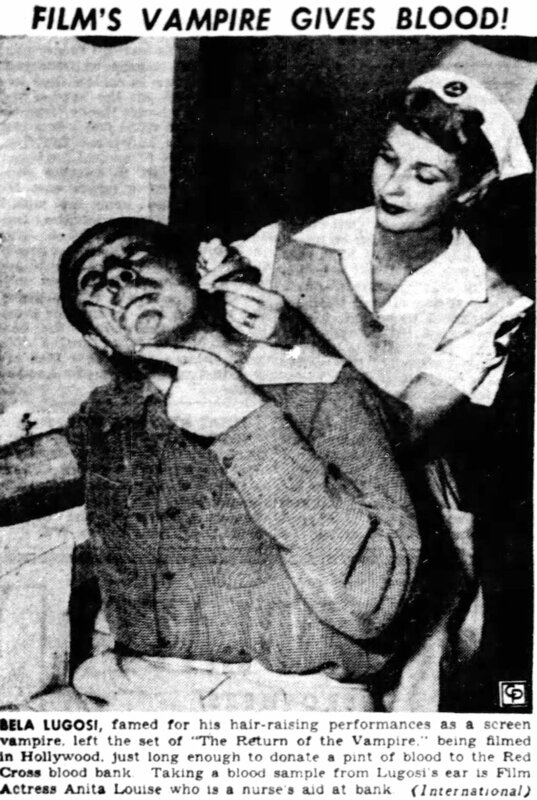 I’ve long wanted to see a few more of Andes’ tv-series, “This Man Dawson,” a pretty tough, made-for-syndication crime series. John K, you brought up the HAMMER sword and sandal movie THE VIKING QUEEN(1967), which I haven’t seen since the 1970’s. It is a somewhat “oddball” movie. I first saw it on the ABC SUNDAY NIGHT MOVIE in 1972. I wasn’t used to seeing Don Murray in this type of movie and he was a long way FROM HELL TO TEXAS(1958). I have never seen the Finnish model Carita Jarvinen in any other movie since. Although, she had a small role in LADIES MAN(1962), which I have never seen. If my memory serves me right, Carita gave an adequate performance in a movie that didn’t have any Viking included in the whole movie! I guess HAMMER FILMS liked the title. making their high def debut next February. Both titles are shot by the always wonderful Burnett Guffey. John K, as of yet, I’ve not viewed SO DARK THE NIGHT(1946) and MY NAME IS JULIA ROSS(1945), but Laura has, over at her blog site. http://laurasmiscmusings.blogspot.com/2014/04/tonights-movie-so-dark-night-1946.html Also, she has a link to her review of MY NAME IS JULIA ROSS and a link to her friend Susan Doll’s review of the same movie. I am familiar with the writings of Imogen Sara Smith and Nora Fiore(The Nitrate Diva). Nora Fiore is a twentysomething Millennial, who actually loves black and white Classic movies. I first ran across her by reading a double feature write-up she did about Mary Carlisle, MURDER IN A PRIVATE CAR(1934) and ONE FRIGHTENED NIGHT(1935) and a review of a Basil Rathbone and Nigel Bruce Sherlock Holmes movie, THE SCARLET CLAW(1944). I enjoyed her take on these movies. I found her on Twitter and I enjoy the photo’s she posts from Classic movies. I ignore her political posts. She is a UX writer, content strategist, and researcher at Marketade in Pawlet, Vermont. Toby, a comment I just sent didn’t get through, but it tells me that “Your comment is awaiting moderation.” So hopefully it will eventually get through. I hope Walter’s comment finally gets through…I’d sure hate to miss it. I’d love to see a Joseph H Lewis Columbia Blu Ray set. fine Randolph Scott Westerns A LAWLESS STREET and 7TH CAVALRY. At any rate it was not long before Lewis was promoted to bigger budgets. incidentally Lewis directed the production numbers on that picture. would have more information on Nora and Imogen. women have this love for classic movies. Laura gives Burnett Guffey his full dues. me and for those great links that you have provided. Blu Ray’s has made these now a “must have” purchase for me. John K, you’re so very much welcome. Like I said I haven’t seen these movies either. As you can probably tell, I like the writing of Imogen Sara Smith. I would like to read her IN LONELY PLACES: FILM NOIR BEYOND THE CITY(2011). Margot mentioned that she was reading the book, over on her DOWN THESE MEAN STREETS site back in August, when she was writing her ACE IN THE HOLE(1951) review. She borrowed the book through our interlibrary loan system, because it is expensive, for a paperback book. Imogen Sara Smith wrote a good article on poverty row movies and she likes DECOY(1946). So, you can tell what are her preferences. Where Nora is 28-years-old, Imogen is 40-years-old, sometimes a few years makes a difference, then again, sometimes not. With me it did, because I look at things different, as I have aged. I have always been a Classic Movies fan and always will be. certainly would certainly add Margot to the list as well. there are others as well that I don’t follow on a regular basis. enough Lesley Selander-he was certainly ahead of the pack there. there were still plenty of revival cinemas showing old movies. CinemaScope screen-unlike many London flea pits. The Tolmer was visited by many future film-makers in its time. dreamed possible only a few years back. get other Columbia Noirs on Blu Ray. BETWEEN MIDNIGHT AND DAWN and WALK A CROOKED MILE. and the icing on the cake would be a Toby Roan commentary on each. like to know what he actually looks like. What I like about commentaries (and blogs) is that I’m not seen. When Criterion made me the gracious offer to have me help out with One-Eyed Jacks, I was praying they wouldn’t want me onscreen! Luckily, it was just a VO. when they make ill informed statements. Julie Kirgo for instance,then its a rewarding experience. video (filmed) offers will follow. You may be right — perhaps something visual will come along. In the meantime, I’m very happy to be audio-only. Speaking of commentaries, I’m doing El Paso in the morning. is inspired to say the least. When time permits I’ll certainly check out more. If you went into detail on the 75+ movies they made, it’d be overwhelming. When you do an overview, you just realize that they were very smart. Make a deal with Paramount for X movies, go round up actors to be in a few of them at a time. By using the same people over and over, I’m sure they became really efficient. The most fun of the El Paso commentary, for me, was digging into the history of the Iverson ranch. John K, like you I enjoy the new breed of female film commentators, of which my own daughter may join in the future, when she finally finishes her masters thesis. We have conversed before about Christopher Wicking, concerning my enjoying his book THE AMERICAN VEIN: DIRECTORS AND DIRECTIONS IN TELEVISION(1979), which he wrote along with Tise Vahimagi. I read the book back in the 1980’s and I realized that I had finally found a book with views that had been formulating in my own head since about 1971. This book actually brought recognition to the unheralded filmmakers who worked diligently to make outstanding, average, or poor shows in episodic television. The book helped me in my personal research of the 1950’s, 1960’s, and 1970’s television era that I grew up with. I have always liked the study of History and its stories about people doing things, whether it be good, bad, or ugly. So, because I also liked stories told visually, through movies and television, I became interested in the History of movies and television. At that time, there just wasn’t that much to read along those lines, where I lived. THE AMERICAN WEST OF JOHN FORD a documentary film, which aired on CBS Network TV on December 5, 1971, really put me on my way in the study of movies, especially Westerns. A week, or so later, I read an article in a magazine(for the life of me, I can’t remember the name) about the movies of John Ford. The magazine was in a barber shop. Well, my mind was off and running. I was having to do it my own way out in the middle border country of the hinterlands. Raymond Durgnat, when talking of establishments of culture in the USA, said that there is certainly the East Coast and the West Coast, and a lot of areas in between. He is right on the money, although the East and West Coast establishments don’t acknowledge anything of culture from the areas in between known as the fly over country. This is where I come from. John K, yes I read your response concerning Phil Karlson and Gordon Douglas. I agree about Joseph M. Newman and I especially like his 711 OCEAN DRIVE(1950) with Edmond O’Brien and Joanne Dru. This movie was one of the first to suggest that the modern mob was organizing itself along big business lines. The gangsters here are well dressed men who meet in boardrooms. They dress and act like big businessmen, not traditional movie crooks. Although, they are just as dangerous, probably more so, as traditional gangsters. I’m not a strict auteur theorist, because I think that movie making is a collaborative effort of many different people trying to do their best. Although, the director is not just standing over by the wall doing nothing. I could add another unheralded one in writer/producer/director Richard Wilson, who directed the Western MAN WITH A GUN(1955) with Robert Mitchum, Jan Sterling, Karen Sharpe, and Leo Gordon. In the past his claim to fame was as a chief assistant to Orson Welles during the 1930’s and ’40’s. I think Wilson did rather well on his own. He also directed AL CAPONE(1959) with Rod Steiger, Fay Spain, James Gregory, and Martin Balsam. Also, Lucien Ballard was director of photography. I’m digging all this stuff about unsung directors. That’s one of my big things with these blogs — to remember the folks who shouldn’t have been forgotten in the first place. There are so many of them! Walter, I’m not a big subscriber to the auteur thing either, though there are some directors where it certainly seems to fit. I think my problem with it is the theory puts real intent onto something that doesn’t always have it. Some of the similar themes from a director came from the simple thought that “Director A did great with Genre B, let’s give him another one.” I mean, you wouldn’t think to hire Don Siegel to do Terms Of Endearment (though that would’ve sold at last one extra ticket – mine). Amen. I’m with you regarding the auteur thing and I do agree that it does fit some movie directors. THE BEGUILED(1971) wasn’t your usual two-fisted action movie, but I think Don Siegel pulled it off. Back to the auteur thing — I think the studios, and the independents, want to protect their investments by using people who’ve already excelled on something similar. (You wouldn’t take your Volvo to a guy who’s never touched anything but Plymouths.) So a director becomes known as a certain type of director, and soon that’d the only kind of movies they get offered. That doesn’t make that director an auteur. Toby, I think you could carry off a visual commentary very well. I look forward to your work on EL PASO(1949) even though it is only a voice over. Yes, good old Iverson Ranch. However, I’ve been wanting to cover Gabby Hayes. Next, I get to do a few of my favorites — Julie Adams, Dan Duryea and Arthur Kennedy. Now if someone would get me to do Mole People so I can cover Nestor Paiva! Toby, Gail Russell’s tragic story makes me sad and it reminds me of some tragic lives wasted in my own family. I knew that about the Iverson Ranch, but it lives on in the movies. May THE MOLE PEOPLE live on and on. Wish I knew someone at Shout Factory. I’d love to drone on and on about The Mole People. I’ve never been to the Iverson site. There is no place on this earth I want to visit more, not even Lone Pine or The Holy Land. Count me in as someone not too fond of the Auteur theory. Auteur but not Henry Hathaway…go figure. It also smacks of an elitist cultish sort of thing. Joseph H Lewis or Sam Fuller it would,by now, be a “cult” classic. my letterbox so I will enjoy getting round to the commentary on that film. reduces in price over time as I’d hate to miss that. HAUNTED WORLD for less than I paid for A MAN ALONE. for me is certainly a guilty pleasure. With Peplum I can use the term without being snobby or elitist. ERIK THE CONQUERER which got rave reviews. documentaries do not seem to have an English soundtrack. but again,sadly all in German. by 7TH CAVALRY. Most Peplum movies were floating releases i.e. the enormous success of HERCULES UNCHAINED. SAINTS paired with Reeves’ THE WHITE WARRIOR. FROM HELL is not half bad either. Hercules In The Haunted World and 7th Cavalry? Man, what I wouldn’t give to go back in time for that one! Hope you enjoy A Man Alone. I have grown to really love that movie, thanks to the time that went into the commentary. A lot of Republic’s technical people were really on top of their game on that one. It’s beautiful to look at. but one. Toby let loose on Hammer-now there’s a thought. Columbia the only major imprint that they now are not dealing with. and Burnett Guffey’s jaw dropping use of CinemaScope. The Sony MOD was very very good. until this Brexit debacle gets sorted out,if ever. Cyclops’ will have to wait until the truly battered pound recovers. aforementioned domestic (UK) Lewis titles. It would seem that Kino Lorber and Warner Archive rarely delete titles. releases are sadly long gone. I also got a copy of “The American Vein” back in the 1980s, and it was quite helpful in bringing a lot of filmmakers to my attention. There just weren’t many books back then covering that kind of territory. Never for a minute really bought into the auteur theory angle, but relished the info the book brought up. Oh, it was obvious to me over time that certain directors consistently seemed deliver the goods, like Andre de Toth in terms of action fare, and William Seiter in terms of breezy comedy fare. Over the years I’ve probably grown more apt to consider production teams, if one wants to observe and seek out actual patterns. Mostly, though, when it comes to vintage films, I just LOVE the minutia. The efforts surrounding the making of films, from procuring stories to casting to (especially) location work and tell-tale artifacts that comprise the mise-en-scene. The facts. The basic historic facts. What I have zero interest in is the utilizing of vintage film as a platform for exploring (and reading into) all sorts of hidden ‘subtexts’ from a decidedly modern, sociological worldview. At that point, I’m out the door. Not interested. Wonderful last paragraph Bert……how very true! That last paragraph could be the Mission Statement for my blogs. Well done, Bert, I couldn’t agree more. Bert, I think you hit the nail on the head, for most of us. What you wrote in the above two paragraphs says volumes concerning today’s so-called film criticism, or for anything else. What is wrong with the good old basic Historic facts. I realize that everyone will see things differently and have their own opinions, but some are trying to change the Historic facts to meet their radical agendas. This is wrong. I don’t like to be told what can be found in a movie. I’ll figure that out on my own, then MAYBE look to see what others have found. Another pet peeve is a really long synopsis. All I want it enough to remind which movie it is, if it’s something I’ve seen, or to let me know the basic gist of it’s something I haven’t seen. Hi,I’m Toby Roan…thanks for ridin’ along….. So go Toby’s dulcet tones on the commentary for A MAN ALONE. the price of the disc by itself. commentary it’s small wonder he has time for anything else. crowd scenes in 50’s Westerns. know with Kim Spalding’s name in the cast IT! THE TERROR FROM BEYOND SPACE will be mentioned. vintage movies will want to miss. beautiful transfer Kino Lorber have given us. Wow, John, thanks for saying/typing such nice things. Your comments about Kim Spalding and Silver Lode kinda reveal my master plan (which is probably pretty apparent). A friend in college was a real jazz freak. I knew nothing about it, and wanted to learn, but didn’t want to blow a ton of money on records I might not like — jazz is a wild, varied thing. He’d loan me stuff and I’d tell him which ones I liked — and based on that, he’d lend me more. He was a great guide and made it a lot of fun. All along, my goal with the blogs has been to do that with these old movies, starting with Westerns — to highlight the people who made and appear in all these things, to provide some context, and to draw some parallels between one picture and another. AND to promote the crap out of certain people and films I thing deserve the attention — such as, say, Fred F. Sears and Fury At Gunsight Pass. To be a guide the way my friend Bill the jazz freak was. A long-winded response, and I hope it makes some sense. Sci Fi Horror fare perhaps that could have saved the studio; a very interesting thought. have been a totally different story. I simply cannot wait to hear your take on EL PASO,so much to cover there. ISLAND that need to be seen. lovely Doe Avedon who later married Don Siegel.